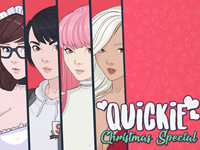 You've seen these girls before in other games Quickie, but today you can pick one of them to spend together the best Christmas evening ever. As usual lots of text that you can skip, but the text is the thing which makes this game passionate and hot. LOVE this game so damn much!!! First of all, I would like to thank you for uploading Camp Pinewood due to my request. Secondly, I would like you to know that I really apreciate and respect your work on this site, giving us the best games in order to have a happy day. I'm not a addicted, just curious to see what games you're uploading, most of them playing just for the story: for example Summertime Saga, Four Elements Trainer and my favourite Good Girl gone Bad, where the story goes depending on your choices. Lovely You'll always find all my thoughts, impressions and sugestions at the comments section according to the newest uploaded game. Talking about sugestions, I would really love to find here some awesome futa games, especially Witch Girl would be just awesome. All in all, yes I do love your site and have a huge respect regarding to your work so keep it up you have serious fans around here.